The league was formed with the sole sponsorship of Mr Foster in 1975 to provide football facilities for youngsters in the local community. The initial season saw 8 teams competing in one under 13 Division - this season we have 434 teams competing in 37 divisions covering age groups from under 9's to under 18's. The phenomenal growth of the League is testament to the hardwork of many people involved with the League but would have been impossible without the assistance we have received from our Sponsor and President. Our long term plans include having our own indoor and outdoor sports complex enabling us to continue as a league but to assist in providing outdoor pitches for games and an indoor hall for small sided events. This will enable the new small-sided teams for boy's aged 6-10 to practice the skills they have been gaining from recent personal coaching. We also intend to undertake providing youth leagues for girls as we find there is now a definite requirement for such Leagues. Again, all our long and short term plans are due to the continued support of Russell Foster who is donating 80 acres of land to the League to enable them to develop their Sports Complex. The President of the Tyne and Wear Youth Leagues, Mr Russell Foster, has been our sponsor since its formation. Russell Foster is a local businessman who has given unfailing support over quarter of a century and has taken a keen interest in the growth of the League from its humble beginnings to the huge League, which it has become. Mr Foster, a family man himself, has always shown intense interest in the activities of the League and careers of several of our 'old boys' over the years. He takes great pride in having played some small part in various local players' start in the Game such as Paul Gascoigne, Michael Gray, Lee Clark, Stuart Downing and Grant Leadbetter to name but a few. 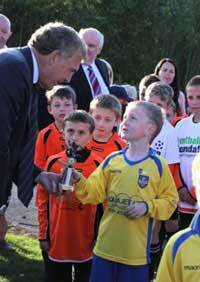 FOOTBALL legend Sir Trevor Brooking was in the region to open a £1.8m football centre. The former England and West Ham midfielder opened the Russell Foster Football Centre, in Staddon Way, Newbottle, near Houghton-le-Spring. Sir Trevor said: “This is a wonderful facility and one that The Russell Foster Tyne and Wear Youth League and the local community should be very proud of. “It is essential that communities are able to access facilities where they can be safe and enjoy quality coaching. Playing sport can teach people – especially young people – essential life skills, such as communication and teamwork. The centre will be the headquarters of the Russell Foster Tyne and Wear Youth League, and provides 21 grass pitches, office space, classrooms and changing rooms. The league, founded in 1975, has produced many famous professional players, including Andy Carroll and Michael Carrick, and has about 14,000 active members, making it the largest youth league anywhere in the country. The Football Foundation provided a £988,869 grant towards the centre. Article courtesy of 'The Northern Echo'.